The European Union Council of Foreign Ministers has urged the Palestinians and the Israelis not to disengage from the peace process, and renewed commitment to a two-state solution. “This is not the time to disengage; on the contrary. Palestinians and Israelis need to show more than ever before their engagement with the international community, with key actors in this process, so that we can together work towards a negotiated outcome,” Federica Mogherini, High Representative for Foreign Affairs and Security Policy said. 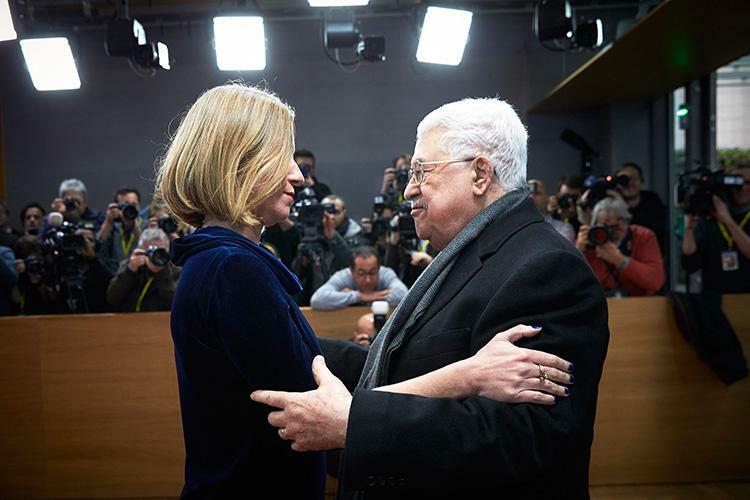 The commitment of the European Union to a two-state solution is not only on paper, but translates into concrete engagements, Mogherini said, at an informal luncheon in Brussels Monday that gathered the President of the Palestinian Authority Mahmoud Abbas and the 28 Foreign Ministers to discuss perspectives for the Middle East Peace Process. The luncheon, held on the sidelines of the EU Council, was an opportunity for the European Union to reiterate its united and clear messages on the importance of preserving a two-state solution and the status of Jerusalem as future capital of two states, an EU press release said. “We continue to promote the two-state solution. We oppose the settlement activity that we consider illegal under international law. To achieve this goal we need to speak and act wisely and consistently with a sense of responsibility,” Federica Mogherini said during the meeting. “I want to reassure President Abbas of the firm commitment of the European Union to the two-State solution, with Jerusalem as shared capital of the two states – the State of Israel and the State of Palestine,” she insisted. “This is and remains the EU position, based on the Oslo accords and the international consensus embodied in relevant United Nations Security Council resolutions. It is also the only realistic and viable way to fulfil the legitimate aspirations of both parties”, added Mogherini. The European Union and its Member States are collectively the largest supporter for the Palestinians and the largest donor. EU support to the Palestinians in 2017 amounted to nearly €359 million, covering a wide range of areas, including humanitarian assistance, capacity building, democratic governance and socio-economic development, the press release recalled. “Our support will continue, including to UNRWA – which is doing invaluable work supporting the Palestinian refugees in and outside of Palestine, and ensuring their access to basic services such as education, health and jobs, pending resolution of their situation,” the High Representative said. Expressing support to the UN Relief and Work Agency for Palestinians is an indirect response to President Donald trump’s administration, which announced last week that it has withheld $65 million of $125 million planned for this year as US contribution to the UNRWA. On the morrow of Trump’s decision, Belgium had announced allocation of $23 million for the UN agency. Part of its support effort to the Palestinians, the EU will host an extraordinary session of the international donor group for Palestine in Brussels next week. The Ad Hoc Liaison Committee will convene on 31 January to look at options of how to strengthen the already existing support. “We have already invested a great deal in the Palestinian state building project, and we are also looking at what options we have to strengthen our support,” the High Representative said. “Gaza, where a humanitarian crisis is unfolding, will also be a central topic of our discussions. And the unification of the West Bank and Gaza under one single, legitimate authority is critical for improving the situation of the people in Gaza,” Mogherini said adding that the EU is also ready to support on-going efforts to ensure progress, including by redeploying its border assistance mission, EUBAM Rafah, if the parties invite the EU to do so. Ahead of the informal luncheon, the Council held discussions on the latest developments in the Middle East Peace Process and looked at how the EU can help ensure engagement by all relevant players in order to advance the peace process.